Holyoke firefighters union president seeks arbitration hearing because of discipline levied related to video | masslive.com. Retirement Board cautions against pension reform – Swampscott, MA – The Swampscott Reporter. The Brookline School Committee last week unanimously approved a new three-year contract with the clerical staff union. The contract includes no pay raises for the first year, followed by 2 percent increases in each of the following years. The contract is retroactive to last year and runs through 2014, which means the 0 percent increase is applied to the previous school year. The school district and the Brookline Educational Secretaries Association had been using an expired contract prior to the new deal. Deputy Superintendent Peter Rowe said the contract negotiations took time to get underway as both sides awaited the results of other agreements. There are roughly 40 employees in the union and the average salary is in the high-$40,000 range, according to Rowe. The contract also includes changes for new hires, including fewer administrative days and longer waits to qualify for benefits. The new contract comes on the heels of the three-year deal signed by the custodian union in October. With the teachers’ union contract signed in November 2011 and running three years, the only significant outstanding union contract the school district has is with the food service workers. via Brookline school district, clerical workers ink contract – Brookline, Massachusetts – Brookline TAB. FOXBORO – Selectmen and firefighters have reached an agreement aimed at ensuring the town pays firefighters on time for special work details. Settling a second union grievance over instances of late payment of workers for details, the board agreed last week to Town Manager Kevin Paicos’ plan to pay a small amount of clerical overtime – about $150 – on a Sunday or Monday when necessary to process the detail payroll without delay. Paicos said many detail pay checks need to be cut following events at Gillette Stadium, and checking the coded submissions before the material is sent to the town’s payroll service is a time-consuming but legally vital duty. He said back-to-back major events at Gillette Stadium are special payroll processing challenges. On Aug. 30, the Foxborough Professional Fire Fighters Association filed a grievance for non-payment of detail wages for the first day of the two-day New England Country Music Festival that began Aug. 24 at Gillette Stadium. The workers were paid one week late. As a standard procedure, the town pays for the details and gets reimbursed by the organization needing the detail. via Foxboro, firefighters settle detail grievance – The Sun Chronicle : Local News: sun chronicle ma, attleboro sun, sun chronicle local news, the sun chronicle, thesunchronicle. The union contract for 14,000 janitors in Massachusetts, New Hampshire and Rhode Island expired at midnight Sunday, and with negotiations for a new contract still unsettled, the janitors could strike as soon as Monday. Since late August, the Local 615 of the Service Employees International Union and the Maintenance Contractors of New England, an umbrella organization that represents the companies that hire the union’s workers, have been unable to agree to a new contract. Officials for the union and the contractors declined to comment about specifics of the negotiations, but said that talks continue. That Mass followed a vigil held at LoPresti Park, where more than 300 people gathered and then marched to the Most Holy Redeemer Church to show support for the janitors. The janitors, who work in many prominent Boston buildings, including the Globe’s offices, are seeking increased hours so more workers qualify as full-time employees eligible for health insurance and other benefits. Janitors have said that employers have avoided giving part-time workers enough hours to qualify for health insurance. The contractors have denied that assertion and said they r have offered more full-time jobs now than when the current contract began in 2007. Two-thirds of the union’s members work less than the 30 hours weekly needed to be eligible for the health benefit, and one quarter of them are within two hours of reaching that threshold, union officials have said. Many janitors are on state health insurance. Clarke, a mother of four adult sons and one grandson, said she has no health insurance. She said she has been trying to work more hours at her cleaning job at an office building in Lowell. But she said she has been scheduled for only 19½ hours each week for the past year. State Treasurer Steven Grossman attended the vigil to voice his support for the union. “The most important thing we need to give people is fair pay and respect,” he said. At the church, Bishop Robert F. Hennessey said Mass before a standing-room-only crowd. “To work for justice, to fight for justice is not something we should be doing, but something we have to be doing as Catholics,” he said in English. Three church-goers then held mops and brooms before the altar as the bishop offered a blessing. The fliers distributed after Mass also listed times and locations for several union member assemblies scheduled to be held on Monday. Should the janitors strike, the contractors plan to use managers and temporary workers to clean the buildings. 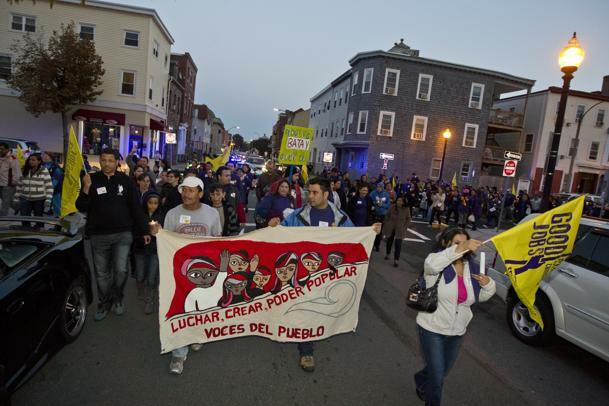 via Threat of strike looms after janitors’ union contract expires with no deal – Metro Desk – Local news updates from The Boston Globe. Warren County workers postponed a vote on a proposed contract this week, and whether it’s voted up or down will have a big impact on when residents see the proposed 2013 county budget. So far, there have been no talk of layoffs in next year’s county spending plan, officials said. Details are typically made public by early to mid-September each year, but they have been sparse this year. That is because the Civil Service Services Employees Association local that represents more than 500 county workers is considering a new five-year labor deal, and county Budget Officer Kevin Geraghty said the county budget team is awaiting a decision on the pact before it releases a tentative budget for next year. A vote on the contract had been scheduled for later this week, but Gene Rounds, president of the union local, said dissatisfaction at the proposal expressed by members at a meeting Thursday night resulted in it being put off indefinitely. Rounds said union members were not enthused about the salary increases and the proposed increase in contributions to health insurance the pact would bring. “The people were very unhappy with it. The raises were not what they wanted them to be and I don’t think they’ll vote for it,” he said. The Post-Star received a copy of the proposal last week. It shows county workers would receive no raises this year, flat $500 bonuses next year and raises of 2 percent in 2014, 2 percent in 2015 and 0.52 percent in 2016. Anyone hired after the contract was ratified will start at a 20 percent health insurance contribution, and reimbursement of co-pays would also be eliminated. Rounds said union members wanted more information on the impact before voting. He said many were dissatisfied at the fact the raises do not keep up with cost of living and insurance increases. Geraghty said whether the pact is in effect next year will have an effect on the 2013 budget, so county leaders need to wait to see if it will be in place before settling on a spending plan. Queensbury Supervisor Dan Stec, chairman of the county Board of Supervisors, said county officials were dealing with increasing state mandates, including a $1.1 million increase in what the county will have to pay in to the state retirement system next year. “That amount alone would put us over the tax cap if we didn’t make cuts,” Stec said. Cuts will be needed in some areas, but so far they do not involve layoffs. “There is no talk of layoffs,” Stec said Wednesday. via Union contract talks delays release of Warren County budget. NATICK — Selectman and the town’s patrol officers union have agreed on a new three-year contract that includes 2 percent increases to base salary rates in fiscal 2014 and fiscal 2015, Town Administrator Martha White told selectmen Monday. The contract also eliminates a sick leave buyback program for employees who have served less than 20 years with the town and adds a 6 percent 25-year longevity benefit, according to terms of the agreement. The health insurance employee contribution rate is 25 percent for new hires and 20 percent for existing employees. Union members will now receive four days of bereavement instead of three for immediate family, a change that makes the contract more in line with other unions’ agreements, White said. Among other changes, the new contract requires officers to wear body armor, a policy White said protects the officers and may help the town seek federal grants. via Natick selectman approve police officers’ union contract – Framingham, MA – The MetroWest Daily News. The Boston Teachers Union and school department ended two years of often heated labor talks this morning after reaching a tentative agreement on a new contract, officials said. The two sides wrapped up talks around 3 a.m., Stutman said after the union agreed to the school department’s salary demands in exchange for concessions on several remaining items. Stutman said the school department agreed to lower class size in two grades in all the city’s under-performing grades, to hire more nurses, to provide schools with social workers the union had requested and equip special education classrooms with more assistants, under certain conditions. Teachers will receive a 12 percent salary increase over six years. The current average salary is $81,600. The contract is retroactive to August 2010. The two sides also hammered out the final details on the implementation of a new teacher evaluation system, Stutman said, which proved to be one of the biggest sticking points as last month Mayor Thomas M. Menino asked the state to step in and try to resolve the acrimonious dispute. Talks were slated to move to fact-finding before an agreement was reached. “It’s an absolutely a great day for the kids of the city of Boston,” said Dot Joyce, spokeswoman for the mayor’s office. Menino, Superintendent Carol R. Johnson and union representatives are expected to hold a news conference at 11:30 a.m. at City Hall to discuss more details of the agreement. via City, teachers union reach tentative contract agreement – BostonHerald.com. Negotiators for the Boston Teachers Union are huddling tonight to come up with a response to a contract proposal they received from city school officials this morning aimed at resolving a two-year impasse with Hub teachers. The city plan came after union officials late last week put forward an offer to make a deal on the two toughest issues facing negotiators — pay and teacher evaluation — all on the eve of a state-imposed fact-finding process that could result in the city unilaterally imposing its own plan. Deputy School Superintendent Michael Goar sent the package to the Boston Teachers Union this morning, addressing not only the pay and teacher evaluation proposals, but a wide range of other issues that have come up over the past two years, as well. The contract proposal would cover the years 2010-2016. Goar said school officials do not want to leave out any issues of contention between the two sides, as the union had last week in trying to break the log jamb by laying out positions only on teacher evaluation and wage proposals. He offered to have the two sides meet Saturday to try to hash out differences if the union responds with a complete list of its positions on outstanding issues by Thursday. Stutman would not say if he was inclined to accept the city proposals on other issues included in the package until after union officials had evaluated the entire package. The union president also said school officials had not fully accepted the BTU’s trade off of the city’s salary position in exchange for a teacher evaluation system carved out by state education officials and used in more than 50 municipalities around Massachusetts. Stutman said school officials want to impose their own evaluation system — a proposal vehemently opposed by Boston teachers — for a year before adopting the state plan. “This proposal starts adopting the state plan next September, not this September,” Stutman said. via Hub school officials counter union contract proposal – BostonHerald.com.